A year ago yesterday, when no one was looking, hungover Sea Otter attendees weren’t up yet or were waking and baking in a team camper somewhere, rode the Specialized Turbo. This version was for the European market, unlimited, non-restricted and with snap-your-head back acceleration. In one stomp on the pedals I knew why Spesh named their ebike the Turbo – could’ve spelled that with all caps and exclamation point. I was on a short leash for the ride, before any PR peeps got wind of it or heard the electric motor whir, but impressed I was. It’s up to Spesh to explain to why the Turbo costs so much, what you’d do with it, battery life, or how it fits your lifestyle. I was just thrilled to ride an ebike that doesn’t look like the ones Lee Iacocca tried to sell in the early 2000s. 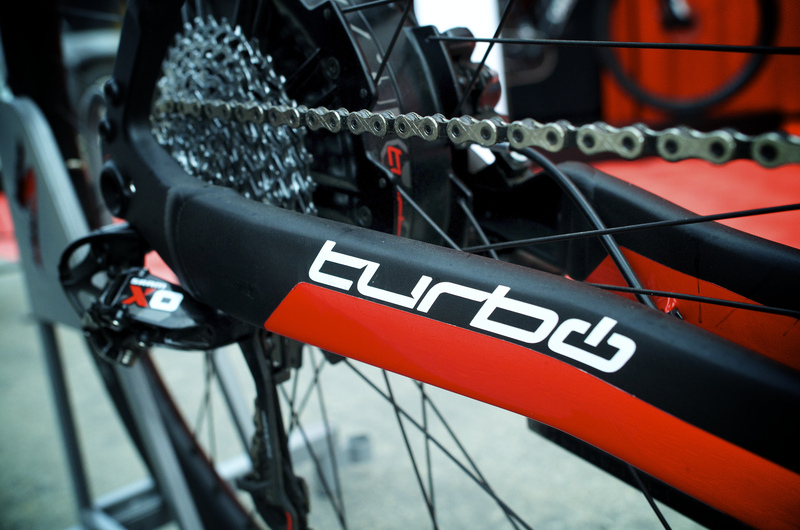 The Turbo is available now in the States, they launched it here yesterday and our boy Cyclelicious attended the event. If this bike appeals to you, call your LBS and put a deposit down now, cause it’ll sell out. Then figure out how to remove the speed limiter so you can ride it like I did. More photos from my ride lightboxed on Flickr and G+. “And it’s really fun to ride,” says Outside’s Micheal Roberts in another report from the launch. How Spesh got the Turbo into the States is an interpretation of the laws about speed limits. Because the drivetrain is a pedal assist instead of a throttle, the laws don’t apply. They just took a closer look at the law, which states that e-bikes must have a motor of less than 750 watts and an unassisted speed of less than 20 mph. Because the Turbo is an electric pedal-assist bike, meaning you have to pedal to get any kick from the motor, the speed limit doesn’t apply. In fact, the only reason it tops out at 28 mph is to comply with European laws, which restrict e-bikes to 45 mph. Specialized installed a governor on the Turbo that automatically turns the motor off when it reaches this speed. The Turbo is governed to 45, which I’m sure every owner and test rider of the Turbo will try to reach.